Sweden woke Monday to the prospect of weeks of political uncertainty after the country's two rival blocs failed to secure a clear governing majority in elections that saw a boost for a far-right party amid growing discontent with large-scale immigration. The governing center-left bloc had a razor-thin edge over the center-right opposition Alliance. With nearly all votes counted on Monday, the ruling center-left Social Democrats and Greens and their Left Party parliamentary ally had 40.6 percent of the vote, while the opposition centre-right Alliance was on 40.3 percent. However, both have vowed not to work with the Sweden Democrats, an anti-immigrant party with roots in a neo-Nazi movement. 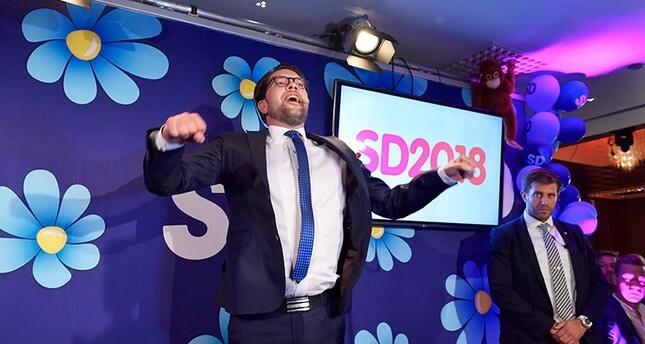 The Sweden Democrats came third with 17.6 percent, about 5 percentage points more than four years ago. The result was largely in line with the conventional opinion polls but below the 20 percent or more figure that some surveys had predicted. "Most pointed towards the Sweden Democrats taking over the position as the second-biggest party in Sweden. But the expected ... bang did not happen," the liberal Expressen daily said in an op-ed piece. "We need to be sincerely grateful for that. Sweden is now on steadier grounds than what we could have feared before the election." But while there was a sense of relief among supporters of mainstream parties about the nationalist group's more limited than expected gains, the election underscored a broader shift to the right in one of Europe's most socially progressive nations.